Help Lynn Win | It's time for a DuPage County Board that represents all of us. From the archives at Backwards and in High Heels…. Last week, we got our Daylight Savings-tired selves out of bed super early, braved the snow and cold weather and went to pay our friend Peter Roskam a surprise visit at the Glen Ellyn Civic Center, where he was having a private meeting. Three friends and I had been planning this for a few weeks, mainly by text, sometimes over margaritas. And guess what? Our plans worked: a couple of us actually got to meet and discuss policy with Peter Roskam, privately. How did this happen, you ask? How did we manage what so many others could not? We planned, we were polite, we persisted. There were about 50 of us gathered at the Civic Center that morning, and after they realized we weren’t going to go away, his aides came out and said he would meet with two or three of us. We were floored but we hid it well. We decided it would be myself and Jen, and since Emily had to take her kids to school, and Lisa was out of town for this meeting, Walt, another local political activist joined us. I engaged my strategy of “fake it till you make it” which, so far, has gotten me through some awkward situations in life: on the outside, I look calm and professional, and just never-you-mind the nervous voices in my head. The reason Peter and his staff decided to meet with us was for political reasons: the media was there and he couldn’t be seen dodging his constituents yet again. So Peter used our meeting to assuage CBS News that he was totally meeting with his constituents! See? What’s all the fuss about, anyway? He’s totally not just running away at the mere sight of protestors! What did we talk about, you ask? I asked about his lock-step voting with Trump even though the majority of his constituents voted for Hillary Clinton, while Jen asked him about his insistent support for the repeal and replace of the Affordable Care Act. What was he like, you ask? He seemed to have a simmering-just-below-the-surface annoyance because he had to actually sit down with us and answer questions. It was clear from his demeanor that he thinks you’re either with him or against him; if you’re not on his team, he doesn’t owe you anything, even though he’s your congressional representative. I started by asking him why he voted against making Trump release his tax returns. He said it would be “opening a Pandora’s box” to make him release his taxes: “what would stop the IRS from asking to see your taxes?” he asked me. First of all, I said, I wouldn’t mind, since I have nothing to hide. Second of all, Donald Trump is not exactly a regular ole private citizen, he is the President of the United States. I asked him if he would support an investigation into Trump’s Russian ties and he said he already did by voting to investigate. I asked if he would change his position on this and he said no. I asked if he would vote to block legislation looking into this in the future and he said no. We’ll see if he keeps his word on that. He sure does keep winning elections: this is his sixth congressional term. But I had an answer for that. 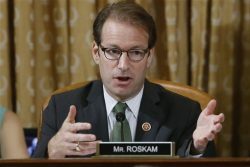 Peter Roskam said “I would agree with that.” In other words: he knows people don’t research candidates and dig deep— and he relies on that type of head-in-the-sand approach to win elections. “We have to look up online to see how you vote, since you never discuss it publicly,” said Jen. “With all due respect, it isn’t our conscience that we’re worried about,” I told him. He didn’t like that. He went on to tell us several stories about meeting constituents who came into his office, crying, because of an issue they had with Obamacare. “One woman sat in my office and cried, because she was going to have to change doctors while in the middle of treatment for breast cancer,” he said. After listening to a few more similar examples, I spoke up. “That is anecdotal evidence that you’re using to support repealing the ACA. None of what you’re describing is actual data,” I said. “That is not anecdotal! Those are real people wth real problems,” he thundered. He was really angered by my assertion and I was really puzzled by his defensiveness because…isn’t that the very definition of anecdotal? I’m not a good poker player and I’m sure my face showed my incredulousness. But before I could offer up my own personal anecdotes about my friends who will be negatively impacted by the Republican health care plan, he stood up to indicate an end to our meeting. “Good one,” he said. “Really, that’s a good one.” He even smiled at me. The three of us ended up speaking with Peter for about twenty minutes. As he himself told CBS news, “I felt it was a highly productive, good discussion.” We were polite, we were respectful but we were firm. He was also polite and respectful. I would like to try and reach out to him again (his aide assured us that Peter would like to meet again as well) to try and find some middle ground in order to make the rest of his term productive; after all, there are twenty months until the next election. I was not intimidated by him. I had no trouble speaking extemporaneously on several issues. I think he was surprised to be firmly interrupted and rebutted by a Mom in a parka, leopard-print winter hat and furry snow boots, but like I said, there’s a new political landscape and he’d best start getting used to it— and to us, his constituents.